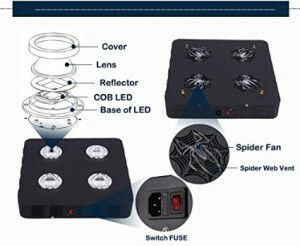 The Spider LED grow light from Twilight Group Co. is a 432 watt grow light for indoor planting. It is full spectrum horticulture technology that includes wavelengths throughout the PAR as well as white light to excite plant growth. It is designed to grow any indoor or hydroponics plants and is a great light for the beginner to the more experienced indoor grower. The Spider is used to grow a large variety of plants including tomatoes, peppers, lettuce, herbs, orchids, roses, basil, spinach, broccoli, wildflowers, cucumbers and even kale. Given the right care and proper management of environmental conditions, the Spider LED grow light can be used to grow numerous other fruits and vegetables. The Spider LED grow light emits wavelengths that support all stages of plant growth and is suitable to grow in tents, greenhouses, hydroponic system set-ups or in a convenient location in your home. The 432 watt LED grow light produces 1800+ umols enough to replace a 1000 watt HPS. 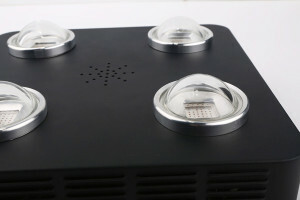 The multiple chip on board design allows the product to run cooler that 3 or 5 watt LED panels. 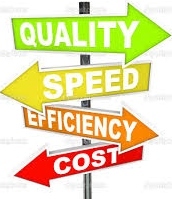 It is efficient and effective and a unit worthy of consideration. Below, you will find a comprehensive review of information associated with the Spider that will help you to better make a decision regarding which LED grow light will best meet your specific growing needs. 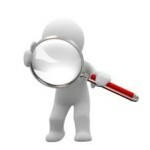 The goal of this review is to help you find the best LED grow light on the market. The Spider 432 LED grow light offers full spectra light with wavelengths that range from 380-850 and white light included to support any wavelength that a plant might need that it would normally get from other grow lights that do not include white. The single 108 watt LED COB provides full spectrum band multi-color chips for a diverse mixture of spectra and the convex lens make the average intensity more like the light a plant would receive from the sun itself. The full spectrum light that the Spider 432 throws hits the research based wavelengths that should give your plants the boost needed to grow well. UV 380nm – This range of light can encourage coloring and thickening of the leaf. UV light is part of the full spectrum light emitted by the sun and does have value to encourage plant development. Although this wavelength is not one that is needed in abundance, it is a wavelength that can support well-rounded development and can be beneficial . 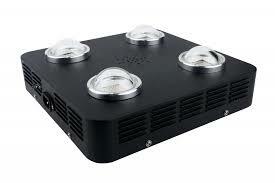 IR 730nm – Like the UV range, the infrared range is also a wavelength that not all LEDs incorporate. IR closer to 1000nm can produce excessive heat, but in the lower range of 730, it can minimally act as a catalyst for chlorophyll production. This wavelength is not one that is needed in abundance, but can be beneficial towards supporting well rounded development. cool white 6500k – Cool white light can support stem development, leaf expansion and vegetative growth. Cool white LEDs can be more electrically efficient than neutral or warm white LEDs and can be beneficial as a source of light that not all LED grow lights incorporate. purple 440nm – Wavelengths in this range can help to maximize photosynthesis and excite peak absorption to support vegetative growth. royal blue 460nm – Wavelengths in this range promote photosynthesis and encourage vegetative growth. yellow 580nm – This wavelength is utilized minimally by plants since relatively little absorption occurs as a result. orange 610nm – royal red 630nm – deep red 660nm – Wavelengths that occur in the visible red spectrum help to maximize chlorophyll absorption. This range is very powerful and necessary for the flowering and bloom stage of plant growth. This range has a primary influence on plant photosynthesis. Full Spectrum Light Emitted – This LED grow light includes full spectrum light which closely mimics the sun’s light. The wavelengths include IR and UV as well as cool white light. 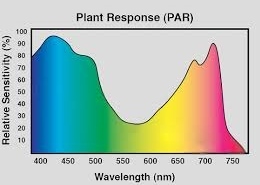 Blue and red wavelengths, the ranges that research reveals is most effective for healthy plant development, are also primary colors included. The ratio of colors incorporated is also specifically designed to give the plants the right “recipe measurements” of light that prompts optimal growth. Money Saver – This LED grow light, like many LED grow lights, runs more efficiently and effectively than other alternative grow lights. A grower does not need to spend money on reflectors or ballasts or other equipment like external cooling fans or ventilation systems. Energy Efficiency – According to the Twilight Group Co., the Spider LED grow lights can be up to 70 percent more efficient than other traditional grow lights. Using less energy is not only good for the environment, but it will save growers a lot of money over time. Since the Spider LED focuses light that plants need most and excludes light that plants do not need, they also run much cooler while acting as a stronger catalyst for plant growth. Lifespan – Many LEDs, like the Spider LED grow light, are rated for a lifespan of 50,000 hours. This means less headaches and replacements and more money in your pocket. An LED that works, on average, for 15 hours per day will last over nine years. This represents a good bang for your buck! As is often the case with full spectrum LED grow light technology, the start-up costs associated with the Spider LED grow light can be prohibitive for some growers. Those considering the grow light should keep in mind the cost savings noted above that are associated with LED grow light technology, and this specific unit. Money saved over a period of time can justify the start-up costs of transitioning to this type of technology. The light is listed at a 5′ x 5′ footprint which is a relatively large areas for a light footprint. I have found that my end-product is always a bit better when I reduce the amount of space I expect the light to cover well. Although an LED grow light may light an area, the high intensity light is often towards the center. This light has the 180 degree beam angle which spreads light out. Keep this in mind when setting up your grow under this light. Do not try to overextend the coverage area. 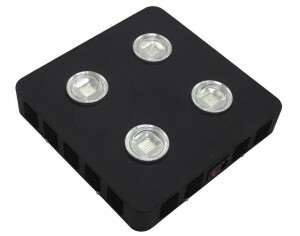 The Spider LED Grow Light can boost growth with full spectra from 380-850nm and white light. It is a powerful light and the convex lens incorporation works to intensify the light emitted by the unit. The 109 watt LEDs can be easily replaced if need be due to the sodering free design and the light can be purchased with a three year full warranty. The Spider is an efficient and effective grow light that can help the home grower produce better and more nutrient rich yields. Whatever it is that you like to grow, the Spider 432w LED can help you grow big at home! 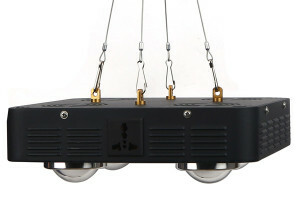 The Spider 432 watt is a median light with power appropriate for a single grower at home. Commercial growers may wish to consider something a bit more powerful. Alternatives are listed below.